TV show Community leveraged the digital world to stay on the air for six seasons – in a way that would have been impossible 15-20 years ago. If I were to tell you that one of the most successful winners of the digital upheaval of the last few decades was a traditional network television show called Community, you’d probably think I were making a bad joke. When we think of digital innovation, the companies that normally come to mind are Google, Amazon, Uber, Netflix, etc – companies that transformed people’s day-to-day behavior using new technology. How could a seemingly standard TV show, identical in format and presentation to hundreds of sitcoms that preceded it, possibly be in the same league or even have anything to do with transformational technology? Well, the format of Community as a TV show may have been standard, but the circumstances around keeping it on the air for six seasons were anything but normal. Community was an NBC sitcom centered around a group of community college students; the show had great critical reviews but perennially bad ratings . Since no one-sentence description can fully explain the absurd and meta humor behind Community, I’ll just link the trailer here to give a better sense of what the show’s about. Toward the end of the show’s third season, it was dubious whether NBC would give it another chance or cancel it outright . 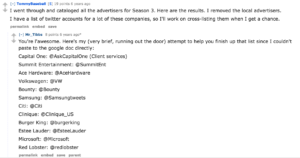 So, the fans stepped in to help save the show themselves: Specifically, a community (pun intended) of fans banded together on Reddit to figure out who the advertisers of the show were and to organize a campaign to reach out to those advertisers on Twitter in order to plea for the show’s renewal [2,3]. (See below for a screenshot of the Reddit group in action ). 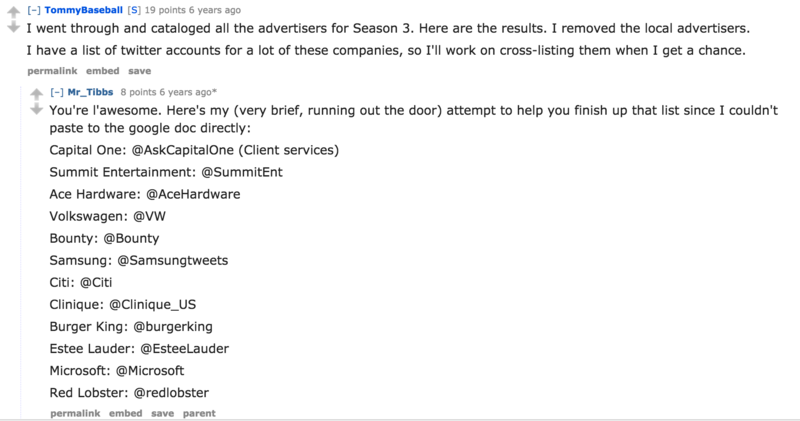 The fact that these fans were able to find out who the show’s advertisers were. How would you possibly go about getting this list before the advent of the internet and search engines made all sorts of information available at our fingertips ? The way these fans were able to organize and communicate with each other from disparate corners of the country. Even if somehow a fan pulled together a list of advertisers, he or she would have no way before the invention of digital forums and social networks to organize a group of likeminded fans in different cities and organize a unified plan. The ability for fans to engage the advertisers directly. Before Twitter, there’s no way a group of lay people could meaningfully engage with major brand advertisers like Capital One and Microsoft. With Twitter, it became as easy as a 140-character tweet. Similarly, another way in which Community was able to leverage new digital paradigms to keep itself alive was by making old episodes available on Hulu .Before Hulu and similar streaming sites, if a user had missed the first few seasons of a show, they were much less likely to join in halfway through the series. By putting those old episodes on Hulu, Community was able to reach users who hadn’t seen the whole show, get them up to speed on what had happened in the plot, and make them excited to tune into future seasons . Finally, when NBC eventually did cancel Community after five seasons, the show was picked up by Yahoo Screen, a non-traditional digital video site . Before the digital age, if a show had been canceled and none of the major networks wanted to take it on, the show was pretty much done for. But in the new world order, Community was able to find a home somewhere outside the traditional network TV structure. Great post, Pasha! And great taste in TV shows! In my opinion, Community has been one of the only shows in TV to get product placement right, and thanks to your explanation about this fan effort to engage advertisers, I finally understand why they were able to be so bold. The not-so-subtle approach of both KFC (https://www.youtube.com/watch?v=CcjW6maPJko) and Subway (https://www.youtube.com/watch?v=NI1l17Q60as) was genius, and helped those brands become more approachable for the millions of us that watched it. I hope we get to see yet another season of ‘Troy and Abed in the morning’ soon! Thanks Pasha. Really interesting to see through your example how content creation is being democratized. Ditto Ross’ point, its interesting how a difference of 7-10 years could have such a drastic difference of outcomes between Community and Arrested Development – another show raved by the critics that through poor slotting and marketing never got the full appreciation of audiences. AD was cancelled but eventually revived on Netlix.